According to the 2010 DoJ National Crime Victimization Survey, 73.4% of completed burglaries accessed the home through a door. In other words, a little front door security goes a long way. And, we’ve already seen how taking certain steps to secure our homes can dramatically reduce your risk of burglary. In a hurry? Here’s what you’ll learn. It’s important to know that you also need to secure other methods of entry to get the most benefit out of this guide. Even though the current focus is the front door, this obviously applies to every external door in your house. Your security is only as good as your weakest link (or window). That fact is evident since quite a few burglars in the survey (~20%) tried to enter via both doors and windows, indicating that they failed at one attempt and then tried another route. Today however, we’re talking about rear, side, and front door security. What front door security techniques will block entry for 33% of burglaries? So you want to slam the door on burglaries? That’s a pretty solid reduction, right? But before I continue, a reality check is needed. You will need several methods to secure your door against different types of exploits to achieve that result. It’s important to consider that 59% of those forced entries using or attempting to use the door removed or damaged the door. A kick to a door can be loud, but if your neighbors just hear one loud sound and don’t hear any more sounds, studies have shown that they will more than likely ignore the sound without even looking around. 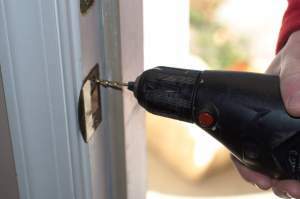 And, there are plenty of quieter methods involving tools like drilling, a screwdriver or crowbar, lock picking, etc. So, how can you strengthen a door against these attacks? A swift, well-placed kick can either blow out the door jamb or split the door. A solid door can still split, but it is much more difficult, and a steel wrapped door is that much more secure. Even steel doors can have surfaces that look like wood so that you don’t lose any aesthetics. Your highest priority should be doors that aren’t in plain view, such as those in the back of your house or side doors that may be obscured by fences or shrubbery. If you don’t have a steel wrapped door and want to save a few dollars and avoid buying a brand new door, you can buy an item to reinforce the door around the locks. Because of the wood that was removed to accommodate the locks, this is the weakest area of the door. You can also get these in a kit with hinge and strike plate reinforcement items. Here’s one on Amazon from Armor Concepts. Door Devil is the other big competitor. If you don’t already have one, add a deadbolt to your doors. The extra bolt will spread the load of a kick to your door more effectively. And even more critically, prevent your lock from being bypassed with a credit card or a screw driver since a deadbolt can not be depressed without actuating the lock cylinder (lock a normal door knob with the door open and push on the latch to see what I mean). If you’re buying one, it’s worth also getting a lock that is difficult to drill out and resistant to lock bumping. This will go a long way toward keeping more sophisticated thieves out of your home (<5% of all burglaries, according to the DoJ survey, although this number is likely under-reported). One such design is made by BiLock. There are other good brands recommended by professional locksmiths, but they may cost north of $200. Unfortunately, these may still be vulnerable to picking and lock bumping. Because of that, I don’t recommend spending your money on locks as your first enhancement. So before you go out and buy one, I found this really cool solution that only costs $7 and prevents lock bumping and lock picking. 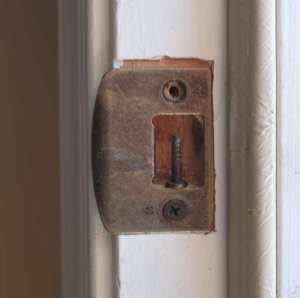 When a door is kicked, the force of the kick is transferred to that tiny metal plate that is mounted on your door jamb (probably a 2” plate with 2 screws) and whatever wood is left in the jamb after the recessed area for the lock is drilled. 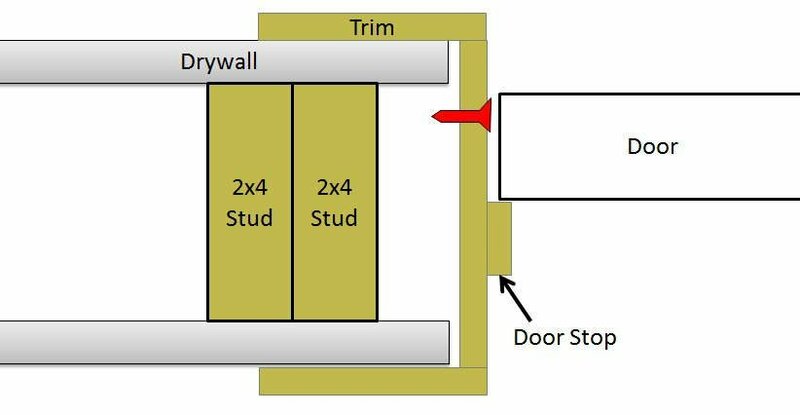 The strike plate then transfers that force through the screws into the door jamb itself and (hopefully, see the box below) into the studs in your wall around your door. Find the strike plates for your dead bolt and door knob and the hinge on the other side of the door. 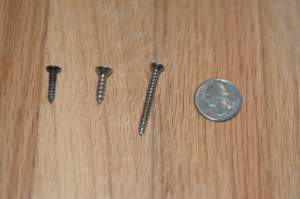 Remove a screw from each to check the length. Do the same for one of the hinges on the opposite side. 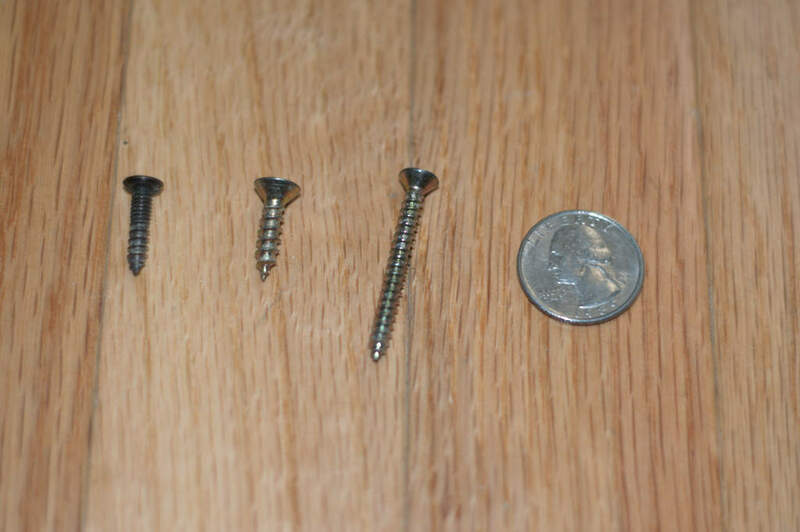 If any screw you remove is less than 3”, you want to replace it and the others with it with something longer. Why, you ask? 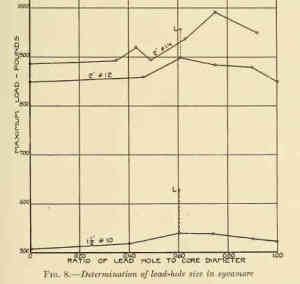 According to Holding Power of Wood Screws, 1926, Bureau of Standards, changing a #10, 1 ½” screw out for a 3” screw can change the load strength from 600 lbs. to 1800 lbs. Now, don’t think that this means it will take a ton of force to kick in your door. 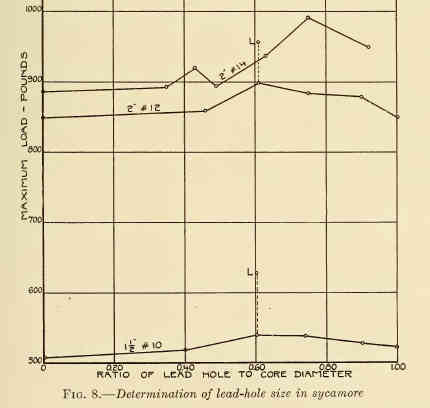 The test mentioned above was set up to pull the screw out (a lateral stress along the screw) and not a shearing stress (across the screw), so the rated force is much higher than it would be in the situation with your door. But, it gives you an idea of the magnitude of improvement you can get. 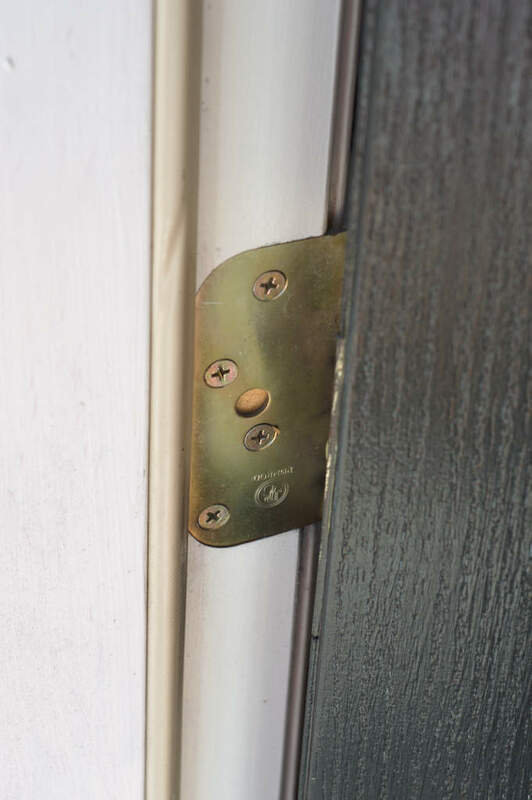 The biggest improvement to your front door security is that you will attach the strike plate to the studs in the wall rather than the thin piece of wood in the door jamb. That way, the screw will spread a load over more lumber, and the door jamb will be less likely to split and give way. Back the original screws out. Screw the new screws in. Bask in your DIY glory. 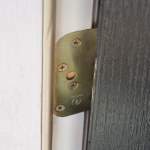 Now, depending on where you live, how visible the door is to neighbors, and how likely you are to be burglarized, you may want to consider a longer strike plate with more holes for screws. That will spread the force over a larger area and withstand some serious impacts. Here’s how you would install that. Check the clearance of the new strike plate to see if it will fit in between the door jamb (wood) and the door. If so, you can remove the old strike plate and skip to step 4 (but it may not look as nice). Otherwise, remove the old plate and go to step 2. Trace the outline of the new strike plate on your door. Using a wood chisel (or a palm router if you have one), remove enough wood to allow the new strike plate to sit flush with the door jamb. Place the strike plate back against the door and mark the locations for the screw pilot holes. Drill pilot holes for each new location. Screw 3” or longer screws into the new holes to attach the new strike plate. Check it out! I just cut my chance of being burglarized 20% by following the instructions at http://24-7-home-security.com/front-door-security/. Next item on my to-do list: Follow the instructions at http://24-7-home-security.com/front-door-security to secure our doors from burglars. It may go without saying, but the same screws that you used to replace the once on the lock side of the door should also be used on the hinge side. 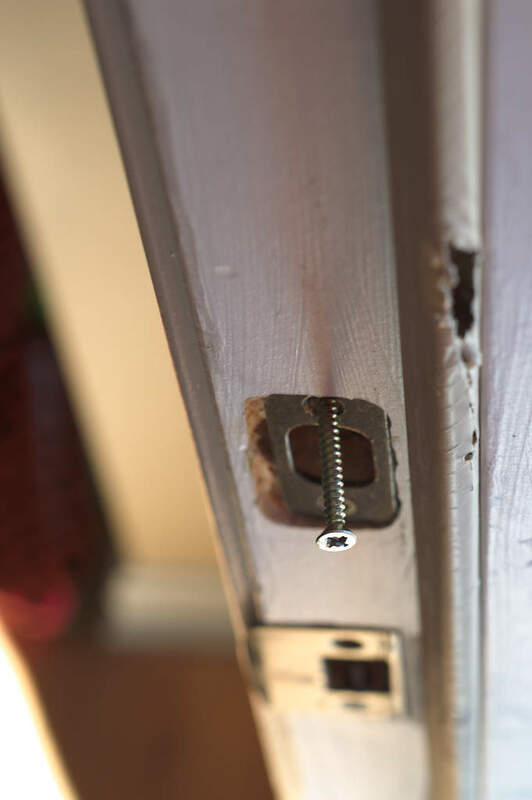 Most hinges have more screws in them, so if you replace the screws in all 3 hinges with 3″ screws then both sides of your door will be pretty firmly secured to the jamb. 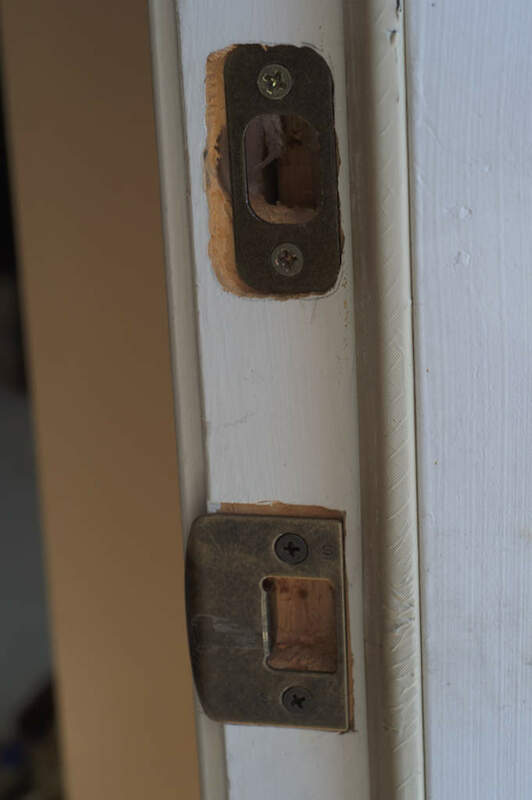 If you want to add an additional security measure or maybe your door has been installed incorrectly so that the hinges are on the outside of the door, then there are hinge bolts that can be installed on the hinge side that add additional strength. You could even add a couple at the top and bottom of the door. OK, we’re off to a good start by defending against the most common method of entry for unsophisticated burglars (most of them!). But, according to the Department of Justice burglary statistics, another 15% of burglars either entered or attempted to enter a house by tampering with or picking a lock. So, we need to make sure we have a defense against that method as well. One way that you can further add to your front door security is with some kind of supplemental door stop. These come in multiple forms and the one that works the best for you will likely depend on the construction of your home. 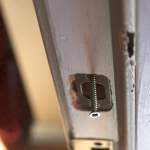 Some attach to the floor with screws and would likely take the most force without giving way, but there is the downside of a permanent installation. 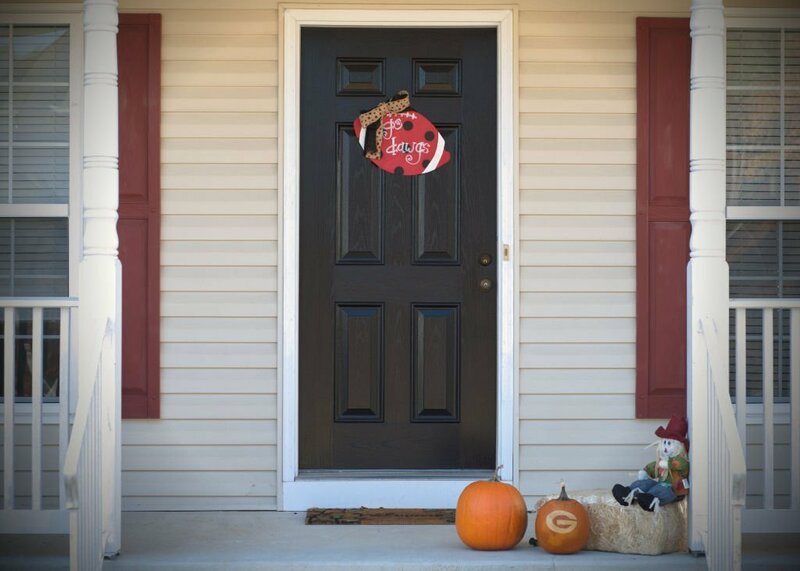 The next people that buy your house may not be as serious about their front door security as you are. The Nightlock goes for a little under $40 on Amazon. But if you want the ultimate in protection, the OnGARD Security Door Brace will set you back $100. Just check out the video of this guy trying to break in the door, and you’ll have an idea of why they can charge so much. The Door Jammer is an alternative that isn’t a permanent installation and can be put in place and removed in 10-20 seconds or so. You may want to consider this one if you have hardwood floors and can’t bear the thought of drilling holes into them. And finally, these door security bars are the ones that you will commonly find in retail stores. This particular one is by Master Lock, is rated really well, and comes in right under $20. Just be warned that a door knob can be removed with a pipe wrench or repeated blows, rendering this method less effective when the interior knob falls away as a result. Going back to our concept of layered security, say you didn’t follow these steps and a criminal does kick your door in or pick, bump, or drill out your locks. What happens then? Ready to explore alarm systems? 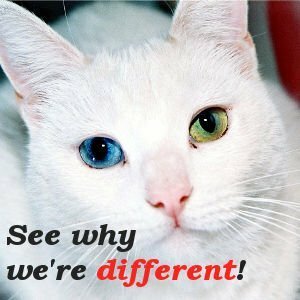 We've done the research for you! Just sort and filter to review the available solutions. If that kind of expense just isn’t realistic for you, then the next best thing is an alarm to notify you when you are home and a thief enters your house. That way, you can call the police and prepare to defend your family. A good way to buy some extra time is a door stop alarm. You can put it in place when you come home, and it will alert you when the door opens. And, as an added bonus, you can use it when you travel too. Or, if you’re looking for something more permanent, they also offer standalone door and window sirens that will get your attention when someone opens your door unannounced. With those methods of attack covered, you will have drastically improved your front door security (and hopefully your other external doors too) and forced a criminal to look for another entrance. Hopefully, you’ve made those just as difficult to break into. If not, you can rest assured that you have tackled the top priority first, and forced any would-be burglar to spend more time outside your home at risk of being caught. If you pair this with some of our other recommended do it yourself security tips, our door security devices article, or our tips on finding the best home camera system to guard your entry, you will be well on your way to avoiding a burglary in your home. Go grab some sweet tea and enjoy a football game, you deserve it. Before you kick back though, turn over a new leaf. 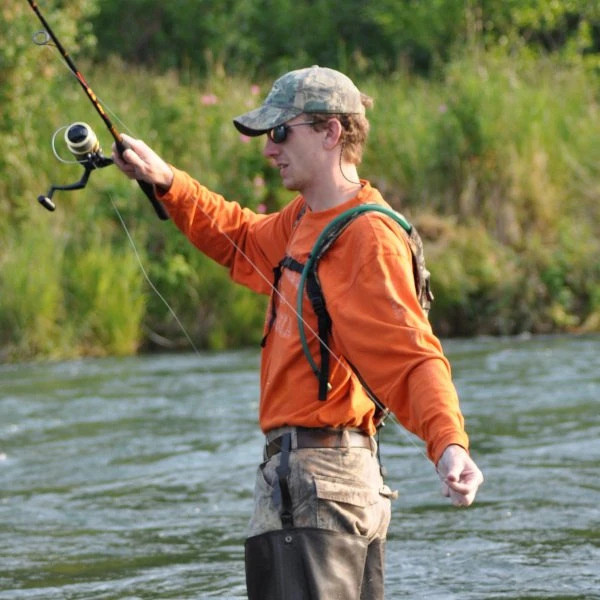 Don’t be stingy and keep this article to yourself, share the knowledge you’ve learned here with your friends. And, if you have any other tips that would help the rest of our readers, please leave them in the comments below.